Diablo was founded with the intentions of offering the 5 million and growing people suffering from Diabetes an alternative to sugar. In the process there has been a vast increase in the number of consumers looking to cut sugar out of their diet but still have those naughty treats. They really are guilt free. 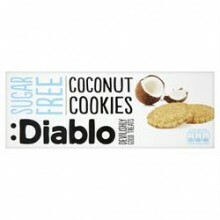 Click the button below to add the Diablo Sugar Free Coconut Cookies 150g to your wish list.